I have fallen into a trap. I have measured my value in a relationship. Many people go through this when you’re at a certain point in a relationship and you’re trying to decide if its time to put a label on what the two of you are. You know what I’m talking about; you’ve been seeing someone for a while, you do like each other a lot, but is it time to go to that next level? Do you put a label on the relationship? But really, what is the point of a label? As humans we need to know what we are dealing with. We love a definition. We love a regularity. We automatically lean towards anything that can delineate life and quell the questions. 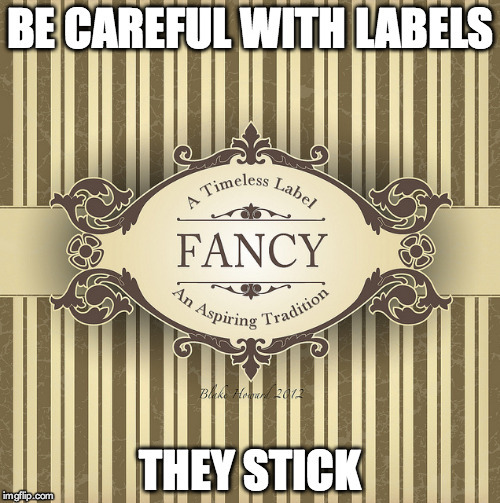 But in reality, a label gives us a false sense of security. Humans should be called Questionables, because we constantly question what we are and what we’re doing and where we are going. Inversely, we dislike change, but we are continually changing. The thing is, someone you are close to can completely surprise you one day because they have changed or are showing you a side you have never seen before. We truly never know anyone. Humans should be called Questionables because we constantly question. And to bring a whole different level to this post, I’ve tried to label a friendship. Its a terrible rabbit hole… because it shouldn’t matter how important you are to your friends… but for some reason quantifying it matters. Its kind of like sitting around asking yourself if you and your significant other are ready for the label “boyfriend/girlfriend”… it kind of just happens. and putting a label or a measure on something only creates pressure on that relationship to be a certain way. Its like putting “best” in front of “friend” requires a whole separate list of needs/wants/desires/requirements. Sometimes I think the only point of Live ClareLesley is so I can air my ridiculous notions out for the blogosphere to see, to suffer through with me, and when I get the realization then we can all walk away changed or at least inspired to stop wallowing. I feel utterly ridiculous that I can’t get this one off my mind. Its been weeks that I’m walking thorough this. I have five people in my life that I consider my “best friends” and usually reach for the phone to tell one of them, if not all when something happens to me. Recently, I went into a really dark place, and wondered if I was the one that people reach for the phone to tell me something. I’ve been thinking about this, and belaboring the topic with several friends, trying to work out my feelings on the subject… and the answer that is continual is: why does it matter? Why do I need to be “the first” or “best friend” or any label of friend? The whole point of labels is security. But what we don’t realize or remember when we demand a label is that it is a false sense of security. Why does it matter if a person has a definition in our lives? Tomorrow they might not still fit that definition. Tomorrow you might not want them to fit that decision. So, the thing is, I want, no actually I need to solidify that other people feel the same way about me that I feel about them. The same is true about any relationship: in a friendship, you want to get to the level of dependability and achieve that “best” title; in a romantic relationship you want “boy/girl” in front of friend; in a job you want a title of importance to show your co-workers and other people in your field that you’re capable of the job, and should get the respect that goes with it. We label because we need to solidify how we feel about others, and how they feel about us. Here’s the thing… we only want a label because we are human. We want parameters for ourselves and others, to understand and realize what we are and what we mean in the world. A label on a can of soup, or a bottle of water, or a box of crackers leads you to believe that something is of better quality. But a lot of times, in taste tests, you don’t taste much difference, or you might even prefer the lower quality. The point is a label only leads us to believe a different set of truths. It requires a different set of rules. We should rejoice in the time we don’t have a label—it requires so much less pressure. The new roommate and I are spending a lot of time together. We have been going on walks and cooking together, and many times, I pick up my phone and she is one of the people I want to tell my breaking news to… but I don’t consider her a best friend… but in a way, she is. Our relationship is easy because we don’t have a label on it. If I forget to tell her something, its fine. If I text her too many times in a day, its fine. I need to treat all of my relationships like this. Live day by day. If I offend or hurt or damage something, I’ll make amends and do my best to fix it. If I am upset, I just bring it up. Relationships of any kind, are so much better when they are easy, and have no pressure. Labels create a sense of false security. It’s a person, not a can of soup. Love the person, leave the label off, and let your expectations and demands on a relationship fall away. You’ll be much happier. Really, you’ll be much happier. ← Be careful the things you say: Your brain is listening. I get really freaked out by the “boyfriend/girlfriend” label because I feel like I adopt different behaviours. I stop becoming the fun loving, flirty girl and sort of fall into this expectation-filled pseudo mom role. I think we have to consciously work on not allowing these things to define us but you’re right when you said it’s all about security. Yezzz Mindy K!!! I love that. It’s so true! Good points. I wonder if by sticking the labels on so tight we’re trying to keep people from surprising us.